Nongsa Beach is one of the most visited beaches in Batam. 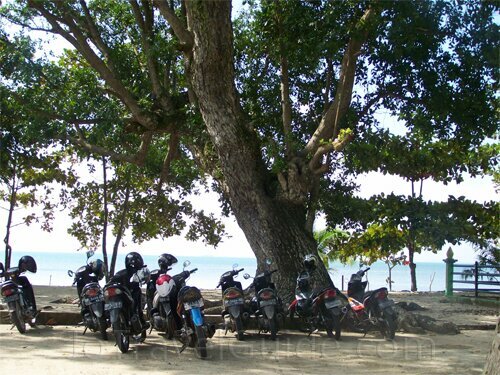 Located in the north eastern part of Batam, the beach is renowned for its white sandy beach and blue clear sea water, which stretches about 300 meters. 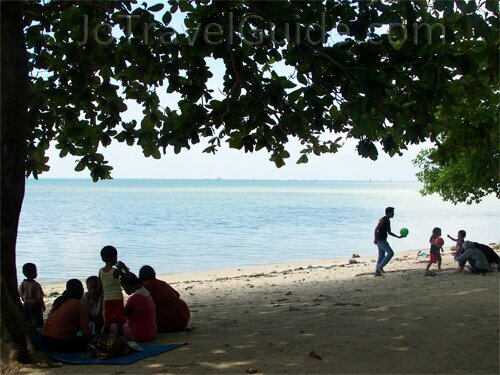 Local families and young people usually visit this beach for swimming or sitting on a mat under a shady tree while eating their dishes they bring from home. Tire buoys are available here too, which will cost you Rp. 10,000 (big) and Rp. 5,000 (small) per tire. You will easily find them on the beach and in front of warung. From Nongsa coastline, you also can see high rise buildings in Singapore from distance. Click the picture above for more and bigger photos of Nongsa Beach / Pantai Kampung Nongsa. 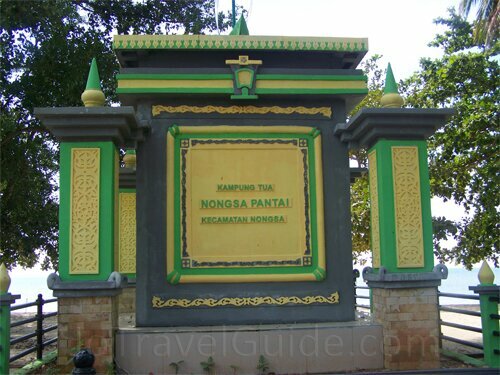 Another reason that Nongsa Beach is worth to be visited is because of a small island nearby, named Putri Island. 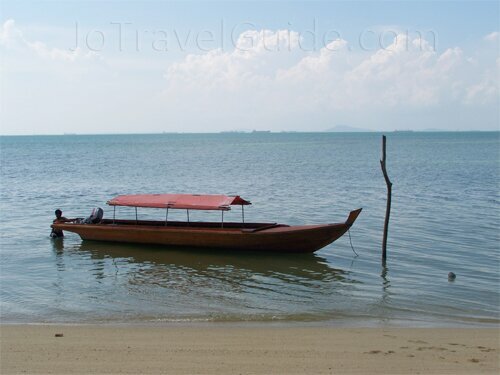 This island can be reached in about 7 minutes by a "pompong", a small wooden diesel-powered boat from Nongsa Beach. 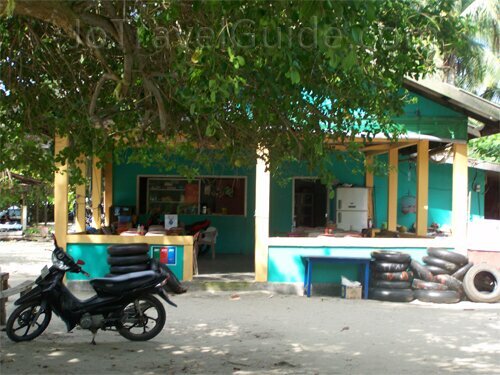 Putri Island is quite popular among the locals because of its unspoiled beautiful place. 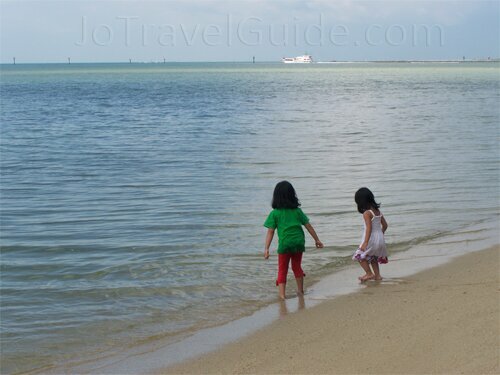 Unlike Nongsa Beach that is dirty by trashes of food wrappers and plastic bottles or cans, Putri Island is still clean. But it is suggested that visitors to bring their own food, drink or another personal needs, since warungs on the island open only on weekends or public holidays. The "pompong" boat fare is Rp. 10,000/person (return fare), a minimum of 5 persons per trip. Boat fare will be higher should there be less passengers travelling together. For instance, 2 persons travelling together, the boat fare will be Rp. 30,000 per person. Don't forget, the fare is usually bargain-able! Remarks : beach guards are not available. You can also enjoy the beautiful scenery of Nongsa Beach from a few beach resorts along Nongsa coastline, such as Nongsa Point Marina and Turi Beach Resort. These resorts offer another side of beautiful scenery of Nongsa Beach.